In a conventional rocket engine there is an ejector plate at the base of the combustion chamber that injects fuel and oxidizer into the combustion chamber at a specified fuel-to-oxidizer ratio. The key challenge is to control the combustion process so that heat transfer to the walls is minimized. The group that best controlled wall heating was probably the former Soviet Union rocket engine designers [Bruno and Accettura, 2008]. Eric Rice, President of ORBITEC had a different approach some years ago that involved controlling combustion and wall heating using the interaction between vortical flows. ORBITEC's patented Vortex-Controlled Combustion Chamber (VCCC) thrust chamber employs a unique propellant swirl injection method that generates a pair of coaxial, co-swirling counter-flowing vortices in the combustion chamber. Combustion of the propellants is confined to the inner vortex. The outer vortex cools and protects the chamber wall from excessive heat loads that ordinarily result from the hot combustion products. Successful testing has already been demonstrated with various propellant combinations including: gaseous oxygen/gaseous methane, gaseous oxygen/RP-1, liquid oxygen/RP-1, gaseous oxygen/gaseous hydrogen, liquid oxygen/gaseous hydrogen, gaseous oxygen/gaseous carbon monoxide, and liquid oxygen/liquid propane. 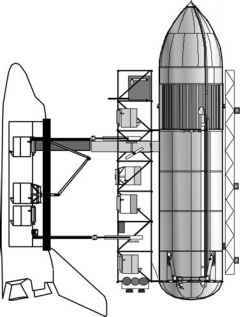 Plans are under way to test-fire liquid oxygen/liquid methane and liquid oxygen/liquid hydrogen chambers. A vortex cylindrical combustion chamber burning gaseous oxygen and gaseous hydrogen at a mixture ratio of 6 was equipped with an acrylic chamber (measured wall temperature ^60° C) for optical visualization of the combustion zone (~3000°C). The acrylic chamber clearly showed the central core combustion vortex away from the acrylic wall. Specific impulse efficiencies of about 98% have been obtained in non-optimized lab-scale chambers. Current efforts aim to test VCCC thrust chamber assemblies at chamber pressures of 1000 psi and thrust levels of 7500 to 30,000 lbf using liquid oxygen/ gaseous propane, liquid oxygen/gaseous methane, liquid oxygen/liquid methane, and liquid oxygen/RP-1. RP-1 is a kerosene blend specially formulated for application as rocket propellant. These demonstration efforts are supported by lab-scale, large prototype and flight weight engine testing, computational fluid dynamic simulations, and numerical analysis of the vortex flow field. The advantage of vortex combustion is that it opens up the opportunity of considering different propellant approaches. One such approach is a new version of the hybrid rocket engine.